Our call and purpose is to bring this work of healing into the Body of Christ in every city and nation according to 1 Thessalonians 5:23. Healing must impact the Body of Christ before the Body of Christ can impact the city. We currently list around 3000 Healing Rooms open around the world in around 70	nations where people are receiving healing for their spirits, souls and bodies. Your participation in giving will help to achieve the fulfillment of this vision. 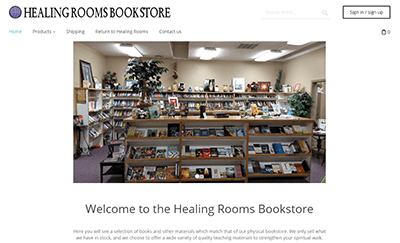 Healing Rooms Ministries began in Spokane, Washington in July of 1999 in a small building with a handful of volunteer prayer team. God began to bring people from all of the world for prayer and the ministry flourished. To help serve the vision of reaching the world with healing, the headquarters has been able to purchase property which now houses the International Office of Healing Rooms Ministries, our Resource and Shipping Department, our Media and Graphics department and our Conference and Training Center, which has become a hub of many activities including trainings, Healing Rooms School of Transformation and conferences to equip the "body" for the work of healing. We are also currently developing a global network to further connect our Healing Rooms family world-wide using the latest media technology. If you end up on the bookstore's front page, that means your donation was successful.